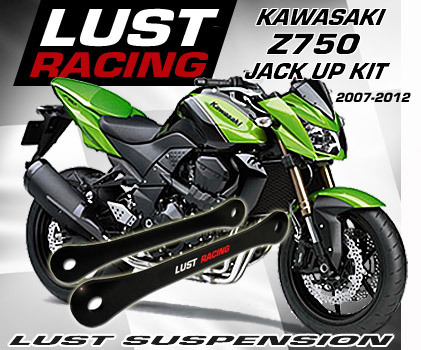 Ride height adjuster kits for Kawasaki Z750 2004-2006 and 2007-2012 models by Lust Racing. Tail riser dog bones from Lust Racing are made in roll forged steel. These links are not only good looking - they will never fail. Supreme quality, made in Britain. The jack up kits for Kawasaki Z750 and Z750R models comes complete with assembly instructions. Lust Racing offers ride height adjuster kits for both early and late Z750 / Z750R models. Please do select the correct year model for your new Z750 jack up kit. Jack up kits will provide quicker steering response, and easier turn in. Rising your rear suspension will make the bike respond quicker to steering input and give the bike a more aggressive look. Copyright © 2009, 2010, 2011, 2012, 2013, 2014, 2015, 2016, 2017, 2018 Lust Racing Limited. All Rights Reserved.